A followspot is a special type of profile lantern which has been adapted to be moved around to follow a performer on stage by an operator. Although the practical operation of the lantern is simple, doing it well requires a great deal of practice. While it’s true that many pop/rock shows may have used the truck driver as the followspot operator in the past, putting the least experienced member of the crew onto followspot duty may be a mistake. In the USA a followspot is known simply as a spotlight, operated by a spotlight operator. A more historic term for followspots is ‘limes’, operated by a ‘lime operator’. The first followpots used limelight as the light source. 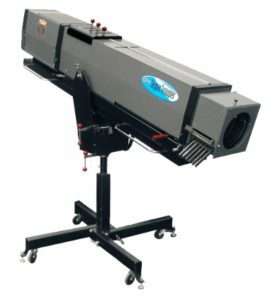 The phrase ‘being in the limelight’ refers to being in a followspot beam. Abba’s song ‘Super Trouper’ is named after a followspot? Here are the lyrics (and video) if you don’t believe me! Your followspot should be properly balanced – this will make it much easier to operate. If it’s not balanced, seek advice about how to make it so. If you find yourself in the position of being a followspot operator and you’ve not done it much before, try to find someone to help you practice before the show starts. Have two friends on stage (gently!) kicking a tennis ball around while you try to follow it. Although it’s unlikely you’ll ever succeed, you’ll learn how much pressure you need to apply to the followspot to move gracefully around the stage. Try to avoid juddery movements, and make each movement as if you meant to make it! As time goes on, practice picking up the ball while it’s in motion. See below for information about using sights to do this. If your followspot has sights already, ensure they’re lined up correctly. Practice picking up small parts of the set around the stage. It should be possible for you to be 100% accurate about these pick-ups, without having to turn the followspot on to check! If you don’t have sights, make some. Use copper wire (or a wire coat-hanger) to fashion two small loops which you can attach to the top of the followspot. Use blackwrap tape to fix them if you have it, as this won’t melt when the lantern heats up. There are some manufacturers who make sights with added functions. Followspotting is hot work – make sure you’re equipped for this. If you’re working in an air-conditioned room, think yourself lucky that the designers of your theatre space allowed for this. If you’re not, wear thin layers of clothing, and use a pair of biker gloves to protect your hands from the heat. If you’re having to work on a followspot with sticky shutters or iris, you can use graphite powder to lubricate the parts. Never use oil on a lantern of this kind. For theatre shows, followspot cues are normally not called separately by the DSM. They are usually tied into lighting (LX) cues. (Followspot cues aren’t numbered in the DSM script – it’s up to the spot operator to keep track of where they are using their plot sheets). The followspot operator will have a plot sheet, usually created by the lighting designer / lighting team, but sometimes written out by the followspot operator her/himself during technical rehearsals. Most followspots will have a local dimmer, separate from the main stage lighting system, which allows the operator full control over the beam. The plot sheet (above) will contain a reference to the size of the beam that’s needed for each cue. There are a number of solutions to make followspotting easier. The ground-control followspot system by PRG enables operators to be situated at floor level and remotely operate their followspot from a safe position backstage, using virtual-reality technology. The light source is a PRG Bad Boy or PRG Best Boy. Automated systems (such as RoboSpot from Robe, Zactrack and Blacktrax from Cast Lighting) removes the operator from the equation, and enables a moving light-based followspot to automatically follow a given performer. Most large modern followspots use an intense type of lamp known as a discharge lamp. This type of light source cannot be dimmed, so mechanical dimming shutters are provided as part of the lantern. (Smaller followspots use traditional tungsten halogen lamps, so have an external dimmer pack). As mentioned earlier, the first followspots used limelight – this is produced by a burning jet of oxygen and hydrogen impinging on a rotatable cylinder of lime, which produces an intense light. The first Super Trouper followspots, introduced in 1956, used this light source. Many movie projectors of that period, and high power film lighting also used carbon arcs (known as Arc Lights). The intense light is produced from an electrical discharge between two carbon rods in free air. The carbon rods are moved close together to start (‘strike’) the flow of electrical current between them. As the rods are moved apart slightly a bright light is produced. As the carbon rods are used up by this process, they must be regularly adjusted to maintain the arc. This light source has now been replaced by the alternatives below. Wonderful demonstration by Mole Richardson of movie lighting with carbon arcs. Two electrodes in a glass bubble filled with xenon gas.